Prejudice Complicates The Course Of Love In 'A Very Large Expanse Of Sea' Tahereh Mafi's new novel follows a young Muslim teenager in the years just after 9/11, and what happens when a popular boy in her class falls for her — will she choose love, or self-preservation? 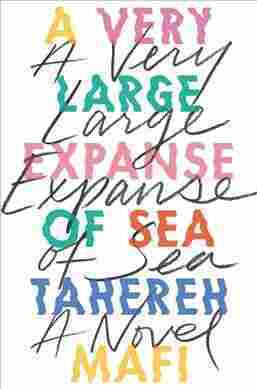 Given what's going on most days in the headlines, Tahereh Mafi's new novel A Very Large Expanse of Sea — longlisted for the National Book Award for Young People's Literature — feels resonant in its somber portrayal of Shirin, a 16-year-old Muslim girl making her way in post 9/11 America. It's a cerebral, impassioned, and zeitgeisty bildungsroman that follows two young people ahead of their time but trapped by a society that strips them of any real power. Shirin and her family have moved around many times over the course of their lives. But starting with a clean slate in every town doesn't wipe away the danger that follows her as a teen wearing a hijab in 2002, a year after the 9/11 attacks. She keeps to herself and channels her frustrations into something she's passionate about: breakdancing. But then she meets Ocean — one of the popular boys in school — who is drawn to her and keeps hoping for more. Shirin, however, is at a crossroads. She's trying desperately to fit in, and she doesn't want Ocean harassed for getting involved with a Muslim. Which will win out, self-preservation or love? A Muslim Iranian-American, Mafi draws on her own experiences in Sea, and her sincerity stands out in full force in her craftsmanship. Mafi's propulsive writing captures Shirin's fears about her lack of agency — she has just as much right to be in this country as her classmates, yet she struggles with injustice, white privilege, racism and discrimination; the institutions that are supposed to protect her are oppressing her instead. She's trying to live her religious beliefs in a hostile environment, and it feels terrifyingly prophetic when examined through today's lens. Shirin also struggles with isolation; her loneliness is nearly palpable. Not only does the constant move make it hard to foster friendships, but her current classmates and teachers have ostracized her because of her faith. While she's close to her brother Navid, her parents are older, more distant — veterans of harsher circumstances, they tend to downplay what she's going through. And unfortunately, despite the wisdom of experience they could be bringing to the scene, they stay mainly in the background, never coming alive as characters and not quite engaging with their environment or their kids. The writing tends to be colloquial throughout the novel, the chapters often reading like personal diary entries, but that's the point — Shirin is, after all, a teenager forced to grow up quickly. (Interestingly enough, she also likes to journal). You can't help but feel for her; she's unapologetically up-front about the injustices in her world and the helplessness she feels around them. She wears her headscarf every day, fully aware of what people think of her, and it's heartbreaking to watch her trying to keep her head up when people on all sides — including fellow Muslims — are criticizing her. Ocean's presence doesn't make her life any less complicated, but he does begin to push her outside of her shell, and she not only broadens his horizons but likes him without the frills of his popularity. The stakes get higher, though, once she realizes just how popular he is, and how much backlash he's facing for supporting her. We all like a good forbidden romance — just ask Shakespeare — but in this case, Ocean and Shirin's relationship and the systematic way their peers and adults try to tear them apart is a brutal spectacle, compounded by the pressure Shirin faces to sacrifice her wants for what she's told are Ocean's best interests. And it's hard to figure out Ocean's appeal at times. He appears to be an allegorical figure, a physical manifestation of humanity's light side whose goodness almost compensates for everyone else's myopia. (Naivete and unquestioning acceptance are virtues, for Ocean.) He's also unaware of the full power of his white privilege until he gets involved with Shirin and the realization of it fractures the bubble he's lived in his entire life. It often seems that they're separated by what feels like a large sea of cultural differences. But even as he's grappling with the horrors of privilege, he's still kind enough, respectful enough to temper her cynicism and help her become someone unafraid to dip a toe into untested waters — so to speak. There is no hard and fast solution to the issues that plague Ocean and Shirin, and they never quite go away. Nonetheless, their polarizing union paves the way for tolerance within the novel's universe, while acknowledging there's still a very long way to go. A Very Large Expanse of Sea is young love at its most gut-wrenching; though it takes place in the past, it's timeless in its themes and will continue to affect readers, months after they've closed the book. Kamrun Nesa is a freelance writer based in New York. Her work has been featured in Bustle, HelloGiggles, PopSugar, BookBub, RT Book Reviews, and Alloy. She also contributes to USA Today's Happy Ever After romance blog.